We all know that the world is changing at a rapid pace, so why not equip your kids to keep up with it? 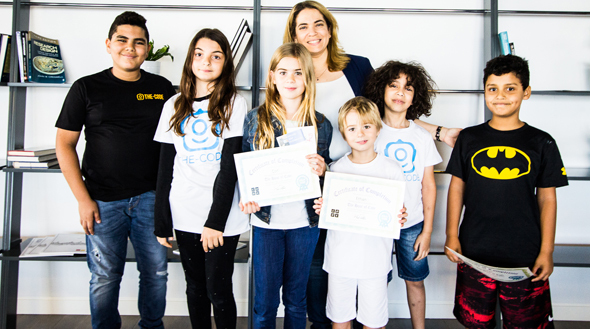 You can start that process with new week-long coding summer camps in Dubai that aim to empower the next generation of innovators, engineers and artists. Run by The Code, the camps run week by week, all through the summer. And the best bit? We have a special What’s On discount code (use the discount code WHATSON when booking to get a Dhs200 discount on the spot). The camp works for children aged 8 to 14 years old (they’re working on no-screen-time coding camps for younger kids too, so follow them on Facebook for updates on that) and there are strictly 15 places per week to keep the teacher to learner ratio strong. “When I learned coding, it changed my life. It changed my career,” said one of the founders of The Code. It’s a fact that our children will have to work with technology in a way that we can barely fathom now, so why not begin to arm them to do so now? How much are the camps? Dhs800 a week, or Dhs600 with our discount! When do they run? Each camp is a week long, and they run every week of July and August in Barsha 1. The camps run from 9am to 2pm, but can also be 9am to 4pm for an extra fee. Minecraft is like the modern-day version of building blocks, and students will work with a Minecraft Editor to build their own game. This will teach them Java and the fundamentals of coding (and all while dealing with Minecraft, a game most of them will already love). Students will then use visual programming to create their computer game – they’ll learn how to create their game environment from scratch and how to add characters and programme them. They will also learn how to photo edit and illustrate, and will use web-based photo editing and illustration tools to create different projects, bringing their works to life on T-shirts, mugs and more. Campers will learn how to design 3D shapes, and they’ll be able to print their art using 3D doodling pens and printers. 1: A Kodu Gamelab Account, with their developed game ready to be shared with friends and family. 2: Their design projects that they worked on during the week. 3: A certificate of accomplishment and a report with the learning areas. – For more information visit The Code’s website (you can book the camp directly here) or call them on (058) 805 7907.